BEIJING, China (CNN) -- Soon after the bloody crackdown on pro-democracy protesters in Tiananmen Square in 1989, China became a world pariah. Bill Clinton, while campaigning for the U.S. presidency, condemned the country's leadership as the "butchers of Beijing," and the European Union imposed a ban on military sales to China that remains in place today. 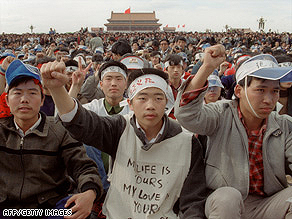 Students from Peking University demonstrate on May 18, 1989, at Tiananmen Square. Doomsayers predicted the imminent collapse of the Asian giant. But the Communist Party survived the dark Tiananmen chapter, largely through strong economic growth that has raised the living standards for some and the allowance of citizens to enjoy personal freedoms and pursue individual dreams -- as long as they do not challenge the state. "Their ultimate goal is to remain relevant and to survive," a political science professor in Beijing said of the government. The academic, who did not want to be quoted by name in order to speak frankly, noted: "They take credit for whatever works, and reject those which do not." For more than a decade, China has averaged nine percent growth a year, boosted by investments and exports. Even though that has slowed to between six and eight percent, it remains an economic powerhouse and a rare bright spot in the global recession. Once dismissed as the "Sick Man of Asia," China is now the third-largest economy in the world -- and some predict it will be the biggest within a generation. Though politics remain authoritarian, with substantial restrictions on freedoms and a dominant one-party rule, Beijing has allowed pluralism to flourish in the social and economic spheres -- meaning that as long as people refrain from taking on the leadership, Chinese can now dream big, get rich and live luxuriously. The events of Tiananmen were triggered by an economic crisis that China fell into in 1988, with rising inflation (that peaked to more than 30 percent in major cities) sparking bank runs and panic buying. Students who worried about finding jobs lashed out against corruption and nepotism. Such widespread discontent set the stage for the public protests that rocked Beijing in 1989. Today, the government does not flinch from taking preemptive measures. "That is one lesson they learned from TAM (Tiananmen)," said a local journalist, who declined to be named. "No if and buts, no hesitation. They nip opposition in the bud." Numerous Chinese journalists, lawyers and activists are in jail for advocating democracy and human rights for victims of corruption and official abuse, or those suffering from HIV/AIDS. Police monitor public gatherings, phone conversations and activities of the country's 300 million Internet users. But the post-Tiananmen generation mostly stays away from politics. They are preoccupied with day-to-day matters and are more interested in making money, not revolution. "I used to want to find out more about it through friends, but not anymore," said Grace Li, who works in a film studio in Beijing. "Frankly, I am the type of person who is super-uninterested in politics. What happened then probably does not mean much to me. I really don't pay much attention to it." Only a few Tiananmen veterans still confront the government. Of the others, some have become capitalists, lured by lucrative business opportunities, while others have been co-opted into the bureaucracy. However, the country's economic miracle has created tough challenges for the leadership, such as inequality and social discontent -- some of the precursors to Tiananmen. On the eastern seaboard, where most of the economic growth is concentrated, people earn about $3,000 a year, but in the western half of the country, many farmers still live on $300 a year or less. Migrant populations are swelling in cities and towns, and not all of them can find work. Scattered labor protests have hit many places as laid-off workers fight to keep their jobs. Sensational cases of corruption involving government officials and business tycoons are heightening the discontent among these groups. As for Tiananmen, relatives of victims renew their hopes every year that Beijing's leaders will reverse the verdict that the protests were a counter-revolutionary rebellion that had to be put down. But a change in the official stance does not seem likely since that would require a political consensus. Conservatives would view such a move as undermining the party's legitimacy and tarnishing the legacy of Deng Xiaoping. It would also put many officials -- some retired, some still active -- who were closely associated with the crackdown open to possible criminal prosecution. "They (leadership) are not in a hurry to reverse Tiananmen. It would be too disruptive," said a junior government official, who did not want to be named. "They hope success will beget success and they will be able to muddle through."